I've been able to add even more Rapala lure's to my collection. Below will be listed some more of them and a little info plus I'll have a few scans of them. It's taken quite a while. I have finally found a Rapala style lure that I have searched all over for. The following descriptions and scans are of them. 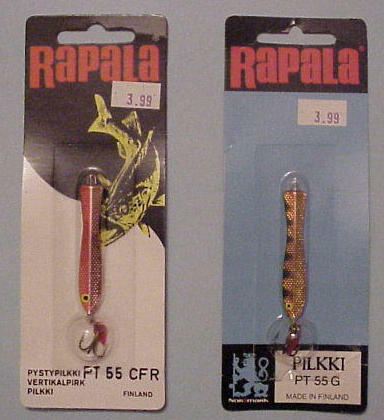 This photo is of a pair of Rapala Pilkki's. In my search for these lures. I followed every lead I got, Wrote letters to everyone I could and after all that. Where did I finally find these, not less than 15 minutes from where I Live. 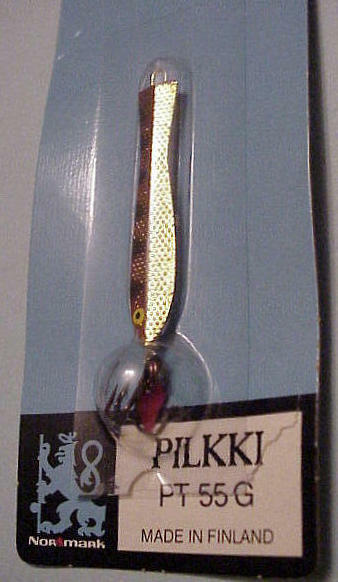 This is a shot of the Rapala Pilkki in what they list as g (gold) It has a nice bar finnish to it. I picked up a lot of Rapala Items (23 items) This turned out to be a great package of Rapala pieces. Several lures in various stages of design. From a basic piece of balsa though all the stages, some with slots cut for hook wire, some in different stages of finish. A testing pole that they use in the Rapala factory to test and tune each lure. 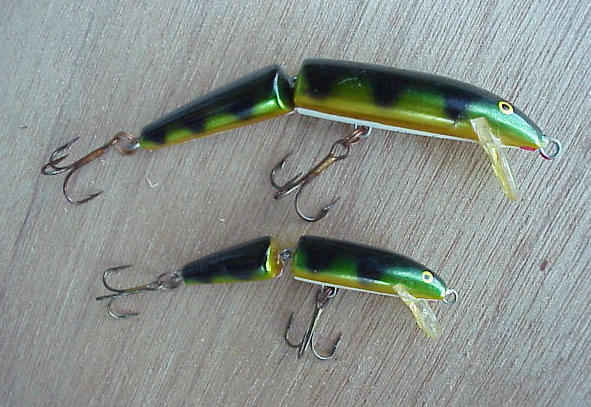 A couple of lure's in color patterns that I have never seen and can't find listed in any of the reference material I have. Plus a couple of special lures, a 25th year edtion lure and a see through Rattlin Rap, it shows the chambers and the size and number of rattles in each one. Also included in this lot were a couple of pieces of printed items, A couple of olded patchs and large decals. This is without a doubt a wonderful addition to my collection. Several pieces of great reference. And to beat it all, I have the knowledge that all of these are what they are, Original and are in great condintion. I hope to soon have several scans of some of these items. F-11S in box.View here. Another View. A Rapala floating 11 s. This lure is marked on the belly and lip in black print. It also has the Rapala 'Fish' logo on the end plate. *Note: This was one of the most enjoyable E-bay Auctions I have had. Very personable and went the extra mile in anwsering my questions. Thanks "L"
A floating Rapala #5 in gold/fluorcent red. This lure is marked on the belly 'Finland' in black print. The lip reads (molded into it) 'Original Rapala Float'. This is the first time I have seen this type of lip mark. It may be due to the small size of the lip or, it's another mark that may help ID and date Rapala's. Anyway, This is a very nice lure and is the 1st one in this color that I have that is black print marked. I just purchased this and the next lure below. I have some info on each one. This one Is in GFR color pattern and comes in the box and with the paper insert. Update! These 2 Jigging lures were better than described to me. I hope to add some scans soon along with some more info. The model info box end plates are, well, I've never seen this type before. I also hope to add scans of them to the "Marks" section of this project. Which I believe can be found on Rapala pg 7. This Rapala lure also comes in the box and is in the Gold pattern. This lure is marked. I hope to have more info and possible a scan of each. Update!! along with the info described above. Both these lures have the Original top to the box, which has the Rapala "fish" logo molded into them. I will continue to add info to these listings as I look them over and catalog them. Both these Lures are in great condintion. So are the box's and paper inserts. This is the smaller of this series. It is in the Blue Mullet pattern. I hope to have a scan of this lure. It is the first one I have in this color. A nice countdown in silver. It is marked on the belly in black print and the lip has the molded mark. The box is not for this lure, but for a floating 7S. It to is like the one descibed above. A pair of jointed floaters in perch. (J-9P & J-11P)These 2 lures both have the white belly and sport the lite gold tone perch pattern. Shallow Fat Rap SFR-7 G.
Another great little find. It's in the box has the paper. Great looking. It's in the gold pattern.